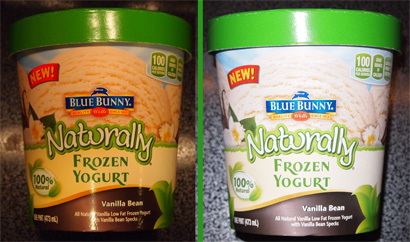 2012 is the year of Blue Bunny's frozen yogurt rebranding. It's not a huge re-branding considering last year's design, but they've amped up the green highlights and gone with the new product name tag of "Naturally". Both elements finish off the design to really drive home the 100% natural theme. I'm there a bit of recipe change to accompany them so let's dig in and find out. Uggg, I couldn't take this picture to save my life the other night, so I gave up. 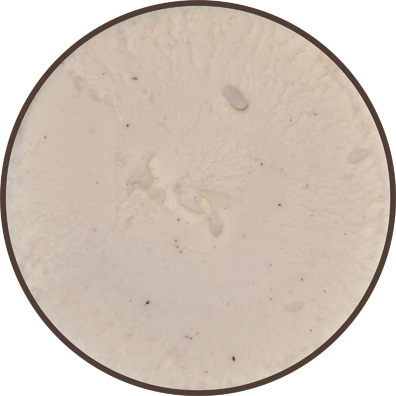 Crack the pint and we've got All Natural Low Fat Frozen Yogurt with Vanilla Bean Specks. It's got that nice off white color and lots of bean flecks, two things I always look for. though I admit it feels very light. I take a few bites and I am not afraid. Ahhh, definitely no yogurt tang here. There is this mild yogurt-ish flavor to the whole thing, but overall this is a mildly sweet flavor. I decide to scoop out half the pint and crash at my desk. I continue onward and notice that there is still a bit of the Blue Bunny froyo icyness. It's not terrible by any means, and I definitely remember it from last year. You know, if I think about it, it kind of reminds me of a gritty half gallon of Breyers vanilla from back in the day. Breyers would have been creamier and without the yogurt taste, but this is reminscent of it. My best tip is to let it melt to let the vanilla flavor come through a bit more. This all lets the melted part cover up some of the grit as well. I will take a little grit over gumminess any day. Grit in ice cream is ok, Gummy ice cream is not. On Second Scoop: After blowing through the second half of the pint as my second scoop, I realize that this is exactly the kind of treat I need to get in my regular rotation. It's not super healthy, it's not super premium, it's that nice low-fat treat that strikes that balance of a fairly clean flavor that won't clog your arteries before bed. I'm trying to use general terms because in that center area of all the ice cream extremes. Let me try it this way. The only real trouble here is that it's not terribly filling and so I run the risk of washing it down with a big handful of pretzels. The point is I like it. It pops more than Adonia, it doesn't have the tang of B&J, and I can't think of a third thing to compare it to at the moment. If you like a little yogurt taste (taste, not tang), then give it a shot! unless it says Greek yogurt, you probably shouldn't expect any tang.